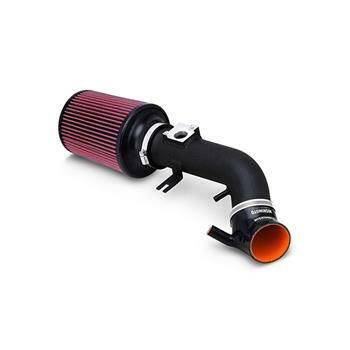 Add horsepower and sound to your ride with the new Mishimoto Performance Air Intake. This kit is engineered specifically for your car and includes everything needed to replace the restrictive stock airbox. Installation is quick and simple, perfect for some extra punch on the street or autocross course. The Mishimoto Air Intake includes everything needed for installation, installs in under one hour, and works perfectly with the stock tune. The mandrel-bent aluminum intake pipe is available with a polished or powder-coated finish. This pipe utilizes a CNC-machined mass airflow sensor (MAF) housing to provide accurate and consistent MAF readings, which translates into a smooth power band. To reduce air intake temperatures, a powder-coated heat shield is placed between the air filter and hot exhaust manifold, significantly reducing heat-soak. The Mishimoto free-flowing air filter provides an 85% greater surface area, optimal airflow, and proper filtration of dirt and debris. The included Mishimoto oiled air filter is completely serviceable, allowing for a lifetime of reliable use. Additionally this intake kit includes a silicone coupler, clamps, and all other hardware necessary to complete a quick installation for easy bolt-on power. Along with an upgrade in power, this intake also provides an aggressive and rich intake tone that is a huge improvement over the stock intake. The Mishimoto Performance Air Intake is designed in Delaware, USA and includes the Mishimoto Lifetime Warranty.